By request, I'm rounding up my favorite scores from Amazon! I realized when I sat down to do this post that I shop via Amazon Prime a lot...like, a lot. I have one touch purchase enabled and use it to buy what we need when I think of it - my Mom Brain will forget otherwise. And let's face it, I'm only taking my colicky baby to my one stop shop (Target) for diapers, milk and prescriptions (and dry shampoo) so if I need anything else, its all Amazon. I'm going to break these posts up into Amazon Faves for the Home, Kids and Mama (!) over the next few weeks, so I hope ya'll get your hands on a few things that I love! And here's a huge hint for those of you renovating, decorating or designing your home: you should always check Amazon for lower prices than big box retailers! We've ordered everything from light fixtures to a bathroom vanity on Amazon with great success and plan to use it on this next round of renovations as well! Our real estate agent asked that we stage our fireplace in our last home with "those white logs everyone loves" and to do it in a matter of hours for listing photos. I won't lie, I am still pissed at myself that I didn't bring home a ton of birch from Maine but Amazon to the rescue. This bundle of Birch logs landed on my doorstep in 48 hours and we were staged and ready to roll. If you're on the Weight Watchers wagon or need to measure corn in order to fill corn hole bags with the regulation amount (the two reasons a food scale is used in this house), this little scale will do you just fine. This baby creates so much storage under a kitchen sink. It has a space for pipes and two levels so that you maximize your organization. I am a big fan of this one. I am OBSESSED with our grey plat mat/play room floors. I continue to buy a pack as we move, need more, need to toss a few squares, etc and I am never disappointed. Our play rooms have both been in high traction, high visibility areas so I didn't want baby-ish colors or themes. The wood tones come in both a light grey (what we have) and a brown wood grain. I highly recommend to anyone who reaches out to ask about them! 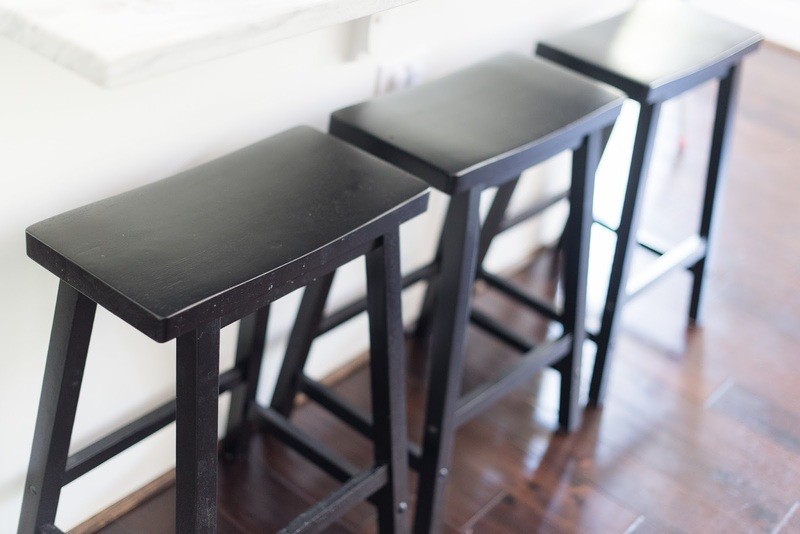 These bar stools are a great dupe for the Pottery Barn stools at a much, much better price point. They are great quality and have held up well through a move and storage - plus the design is classic and will work with a ton of different decor schemes. A classic, crisp white pillow cover is a must for me in our Master but with a three year old and a baby, the white tends to get dingy fast. I decided to go low price point so I could bleach or replace as necessary and I love these shams. I have replaced a few (one bit the dust in a red wine incident, oops), I never sweat it because of the eight dollar price point! Yep, we bought a bathroom vanity from Amazon! We purchased this vanity for our children's bath renovation in our last house and loved, loved, loved it. I actually think we'll do the double vanity for our master bath renovation in this house, we love it so much. We chose to do ours without the countertop and have our stone yard cut a counter top for us to save money on freight and were so pleased with the look. The drawers are soft close, the storage is plentiful and the overall construction was really sturdy. My friend Ailee photographed the product images for the shop that sells these belly baskets via Amazon and I feel in love. Belly Baskets can be super pricey so I though $38 was a fair price for these beauties. I plan to stuff one with blankets and one with a faux fiddle leaf in our current living room! The easiest, most cost effective way to spruce up an IKEA dresser is swapping out the drawer pulls! Justin and I bought a second-hand Hemnes dresser when we were dating and while it is on it's last leg, it still looks great because of the pulls. Swap out the hardware on your IKEA pieces and thank me later! Oh man, do I love my ghost chairs. I've always wanted a pair but didn't really think they fit the vibe of our last house - so this house was getting a set, no matter what! I added them to our white wood kitchen table as the head chairs and they serve two purposes: 1. to lighten the space and 2. as a toddler friendly seat! Our other chairs are fabric so I needed an option for my son - these are an incredibly deal at $105 for the pair, are sturdy and wipe clean. A few years ago, my best friend Megan purchased one of these for her playroom and immediately send me a photo of them with the caption "you need these". We now own two white storage chests in our playroom and I love them. The open bins allow for little helpers to put things away easily, they store a ton and are well made (they survived the move easily!). When the kids are a bit older, I'll add baskets to the top shelves to make things look a bit cleaner and will leave the bottom bins open to store balls, games etc. $25 for a king duvet cover and two king pillow cases? Yep, and they are crazy soft, too. I've purchased two of these - one for our master and one for our guest bed. I can't get over how soft they are. If you're in the market for plain white bedding, I can't recommend this duvet set enough. And no need to be afraid to bleach it or replace it! We also own this down-alternative comforter, another great Amazon find! If you have any questions about any of these items, please feel free to ask in the comments! We own them all, have used them all (some in multiple houses) and these have been some of my best Amazon scores to date! Do you have a king size bed? If so, does this down alternative comforter fit? I've had a hard time finding comforters that will cover my entire mattress on the sides...so frustrating! I need that storage chest!! i had no idea you could buy belly baskets on Amazon! They are referred to as fair trade baskets here in Hawaii and on our recent trip to Bali, I stocked up in the markets! I love that look so much and keep all my houseplants in them to hide the grimy planters. Now I feel like I need to stock up!